“My parents didn’t own a car, but they did have a guitar, an accordion, and a piano. So I’d like to thank my parents for having their priorities straight,” musician Alan Doyle explains gratefully. 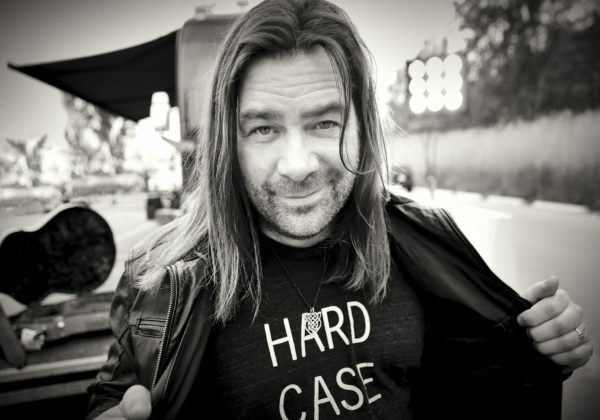 Canadian singer-songwriter Alan Doyle is on a roll. He’s currently on tour playing sold out shows, including the Sellersville Theater earlier this month. His high-energy, engaging concerts are always a big draw. I was lucky enough to catch both the Sellersville and DC shows, both very diverse, and included traditional Newfoundland songs, sea shanties, cover songs, rock, and roll, as well as tunes from Doyle’s tenure with iconic Canadian band Great Big Sea. Audience participation abounded, two birthdays were celebrated, and one couple got engaged. Seriously, no one does it better than Alan Doyle and his Beautiful Band. Doyle spent two decades as one of the lead singers of Great Big Sea, known for combining traditional Newfoundland music with pop sensibilities. The band’s nine albums, double-disc hits retrospective, and two DVDs have sold over 1.2 million copies in Canada alone. The charitable organization Doyle founded with Dr. Andrew Furey and Brendan Paddick encourages folks to donate a dollar or more a day. The funds raised sponsor programs and facilities which help people suffering from mental health issues and addiction get the treatment they need. It’s called A Dollar A Day Foundation and you can donate here. Never one to sit still, Doyle spent 2017 recording his third solo album, A Week at The Warehouse, and putting the finishing touches on his book, A Newfoundlander In Canada: Always Going Somewhere, Always Coming Home, the follow-up to his best-selling 2014 memoir, Where I Belong. Turning to Great Big Sea bandmate Bob Hallett to help jog his memory of their early days of touring, the book is a treasure trove of the band’s beginnings and early gigs playing pubs and at least one dance hall in Stephenville. After catching our breath from laughing at these tour stories, I ask Doyle about the new album, which was recorded last year at the Warehouse Studio in Vancouver. Doyle worked with famed producer Bob Rock (Aerosmith, Bon Jovi, Michael Bùble) and features guest vocals by Paul Hyde (Payola$, Spirit of the West). Every song, save two, were expressly written for the album. The song “Close to the Sun” was written by Doyle six or seven years ago and never made it into any records, but his band (Kendel Carson, Cory Tetford, Todd Lumley, Shehab Illyas and Kris MacFarlane) loved it, so they started playing it at live shows. The track “Bully Boys” is a sea shanty that Doyle wrote in 2009 when he played one of the Merry Men in the Russell Crowe film “Robin Hood.” When deciding which songs to include on the album, Rock asked Doyle if he had any Celtic-style or sea shanty songs. Another song that has been very popular with Doyle’s audiences is “Beautiful To Me.” It was inspired to be a response to the discriminatory Bathroom Bill that North Carolina passed a few years ago. If you’re interested in seeing his live show, be sure to join his email list to stay updated about upcoming performances and all things Alan Doyle.